Greetings, fellow Vikings! We have been busy in Cologne to bring you the greatest update ever released: Valnir Rok 0.6.0 – or as we call it: The Combat Update, which is available now! 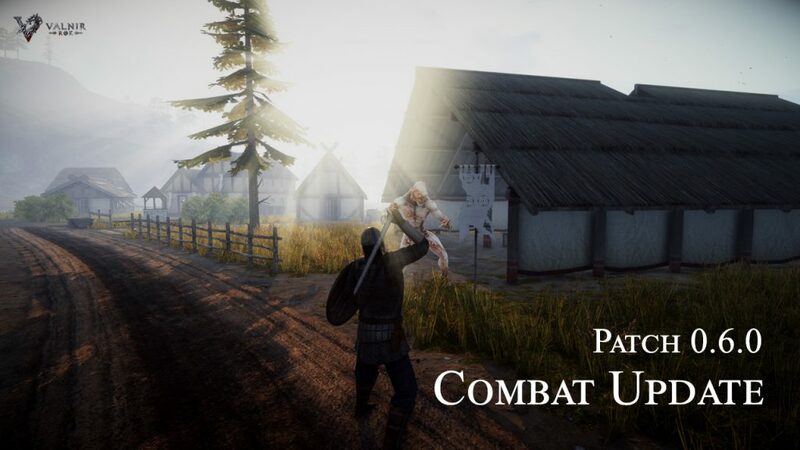 It features a brand-new combat system that we designed completely from scratch. It consists of four core moves, which can be used to counter each other. The Base Attack hits enemies in front of you with a wide swing, while the Heavy Attack will inflict deep wounds, but needs to be charged first and aimed with precision at your foes’ heads. With the Low and High Block, you can protect yourself from lethal attacks. All of the new core moves can be executed both while standing still and when moving around the enemy, which makes the combat overall more fluent and provides players more variety in maneuvering during a fight. We also tackled our biggest enemy: The Lag. In the past two months we engineered an entirely new and blazing fast netcode that carries time critical information such as player movement and all combat moves with as little delay as possible. Now, even playing on servers in other regions works like a charm with no noticeable delay. We also improved the overall game performance drastically. We worked on our rendering code and during all of our tests we saw significantly improved FPS and little to no stuttering. So we established ideal conditions for rapid PvP battles that are determined by skill, not by luck. But not only that, we also fixed a great number of bugs that were reported by you. Some of them have existed for way too long, so we are happy that we could get rid of them once and for all. One more thing: Even though we released the greatest update in Valnir Rok‘s history, we decided to keep all existing character data. So hop back into the game now and check out Patch 0.6.0! Now that the combat update is released, we are already planning what we want to deliver in Patch 0.6.1. We can‘t say much yet, but it will focus on balancing and also one of Valnir Rok‘s most popular features: Quests. Various performance improvements that increase the overall FPS as well as drastically reduce FPS drops. Improved character movement which is less delayed and more controllable. Overhauled animation system including completely new and handcrafted combat animations. Completely new networking system that heavily reduces latency and mostly eliminates lag and desyncs. Jumping and falling now behaves physically correct and feels more natural. Added a blood stain effect that makes creatures look visibly injured when their health is low. Added a weapon trail effect, making attacks appear more smooth. Added a mini map that can bee seen in the top left corner of the screen. The base attacks are now quicker and can be performed while remaining standing still. The heavy attack is now performed by holding left click. The heavy attack now only hits an opponent in a narrow area before the character, requiring to aim it more precisely. All attacks can be performed while moving. It is no longer possible to run with a drawn melee weapon. Evading is now bound to the shift key when holding a melee weapon, reset your keybindings to apply the changes. Evading can now also be performed by double tapping W, A, S or D.
Evade distance has been increased to 6 meters. Increased the range of the base attacks to 1.7 meters. Reduced the range of the heavy attack to 1.2 meters. Ranged attacks are now performed using left click only, right click just zooms the view. 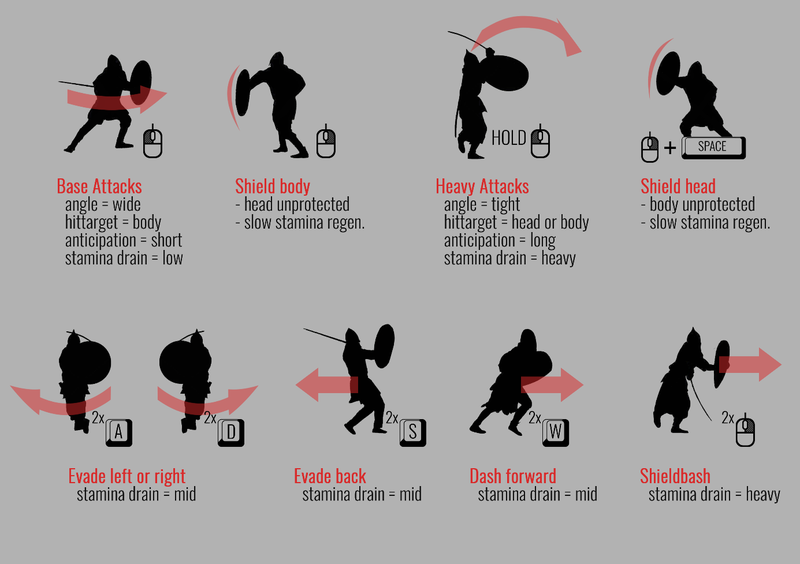 A shield bash can be performed by pressing left click while blocking. There is now a low and a high shield block. Hold space bar while blocking to cover your head. The low shield block will only block base attacks, but no heavy attacks. The high shield block will only block heavy attacks, but no base attacks. When left clicking with a melee weapon equipped, the character will now perform an unsheath attack. The stamina cost of evading has been increased to 25. The stamina cost of the shield bash has been increased to 30. Jumping is now possible during combat and costs 5 stamina. The stamina cost of the base attack has been reduced to 15. The stamina cost of the heavy attack has been reduced to 30. The stamina cost of base and heavy attacks now vary based on the weapon weight. The stamina cost of blocking an attack has been reduced to 10. Stamina regeneration speed has been reduced by 50%. Stamina is no longer regained while blocking. Low stamina will now be shown through a screen effect and an “exhausted” animation. There is now a chance to land a critical hit with melee weapons that inflicts twice the damage. The primitive bow and the primitive shield can now be crafted without leather. The NPC health bar has been adjusted to be easier to understand. Fixed a bug that caused the graphics options for detail density and detail distance to not apply correctly when set to 0%. Fixed a bug in the hit detection that could lead to a hit not counting when attacking an enemy to the left of the character. Fixed a bug that lead to the spine of the character not being animated correctly. Fixed multiple problems that could lead to a character falling below the terrain. Fixed a bug that could cause a weapon to be invisible when unsheathed. Fixed a bug with water hindering the interaction of NPCs and objects on the shore. Fixed a bug that sometimes caused projectiles to inflict no damage to other players. Fixed a bug that prevented the “Quit” option from working correctly. Fixed a bug caused heavy attack hits not to register in certain circumstances. Fixed a bug that caused the ocean to be displayed before the loading screen when joing a server. The player should no longer remain in combat mode when the equipped weapon is unequipped. Fixed a bug that resulted in no available quests for some new characters. Fixed a bug that caused a wrong animation to be played when the player character was hit by an attack. Fixed multiple bugs that prevented the mount from being summoned. The player is no longer invulnerable when on a mount and does no longer invisible when mounting/dismounting it. Fixed a problem that caused the player to clip through the saddle when riding. The player should no longer be able to move through objects using the mount. Building damage should now be applied correctly. Closing windows should no longer trigger an attack. Fixed a finger positioning problem in the unarmed combat animations. Fixed a bug that caused map icons to not be displayed the first time the map was opened. Fixed a bug that caused wrong names to be displayed on the health bar at the top of the screen. Fixed over 40 display and placement problems all over Valnir Island. Fixed a bug that caused totems to last shorter than displayed. If you know someone or if you want to help us to translate it to french let me know! Hi Yordanorn, we know a bout the performance issues. This should be fixed with the next next patch that the devs try to release at the end of the month with an bigger combat update. What does patch 0.6.0 means for us? No desyncs, no lags, completely new combat and netcode! Do you have questions about the 0.6.0 Combat Update? Great! Post your questions here. We’ll collect them and make a Q&A video where we will answer them in person and maybe tell you a little bit more about the future of Valnir Rok. Hi doglawur and welcome to our forum! At first : Thank you for the feedback! You can build tents - so if you are far away from your base you can build a tent to spawn there if you die . Or you build a bed in your base. You shouldnt be able to make silver out of iron ore, do you mean Ironbars? Note: This is the early access phase of the game. Features can be buggy and unfinished, even the content is not yet fully published. What if I need quick help? I found bug, where should I report it? The best to report bugs is ingame via the menu. If you want to show us a screenshot, you can press "ins" before opening the options. The screenshot will be attached directly to the bug report. Reporting bugs in the Discord or Forum usually doesn't provide enough information, because the ingame report provides more technical informations. If it is necessary to fix bugs or to implement new features yes. However, we try to avoid this as best we can. Will the server software be released ? Yes, it will be released, when is still unknown. We will inform you when the time comes. Do I have to repair each component individually? No. You can build a totem and sacrifice to the gods - they will stop the decay for you for a while as long as you don't forget them. Am i allowed to Stream the game on Twitch/Youtube/etc ? Can I change my character or reset my skill points? At the moment this is not yet possible, please contact a Game Master in Discord. The appearance can currently only be changed if the character will be deleted by a GM, but also the rights to your buildings and items are lost when we do this, so you should think about it carefully. Features to reset skill points and customize the appearance will be available as fast as possible. Where can I post my ideas/feedback/criticism about the game? We always like to see constructive criticism, ideas and feedback! The best place for that is our forum. We always keep an eye on the forum. Even if you don't always get an answer from a developer or GM, you can be sure that it will be read and thought about! If I want to join a server I get the message "Couldn't spawn player" What can I do? If you get this message you just have to wait, after a few minutes you can join again. Here is the updated roadmap for the upcoming patches. we will reward players who have supported Valnir. Who can get a limited steel helmet or silver sword? - Anyone who has recruited at least 3 clan members (naming the players)*. Who can get a limited steel armor? - Everyone who has recruited at least 5 clan members*. For this hewill be called "Hersir". Who can get a gold helmet or gold sword? Hi OsmosXTRM , and welcome to our forums! Unfortunately youre right, actualy there are not much player in the game - but were on a way to change this. I can definitely tell you that our Devs dont just grab the money, they work hard to make this game better. Our Dev team is acutaly very small, so new things and bugfixes need more time than in big studios. Hi and Sorry for the late answer! Really? That's an interesting way of executing customization. Will it support mods on top of this? With this release we upgraded to a newer Engine-Version. This might cause some things to break that we didn't catch. One such thing is for example the sky system we use which results in strange results during night time (we are still working on improving night time though). - Horse has right Animator, jaw and reins dont bug away anymore. - Brigandine armors are now available in all colors. - Armors for the female character (Lammellar, small lammellar, scale, small scale) are fixed and updated. - Fixed an issue that caused items to be copied multiple times when being hit due to infinite durability. - Dragonslayer Quest finishes now. - Fixed a bug that prevented built structures form updating their owner correctly, when a player joins or leaves a clan. - Player gets damage while holding shield + stamina under 15. - Portuguese expressions fixed, UI in main menu shows every language setting in each language now. - Furnace, palisade and workbench are translated now. - Quest Homesick progresses after killing the Kvelling Ghoul. For now, just one ghoul spawns. - Horse makes sounds while running now. - Running with an unsheathed weapon now costs 3 times as much stamina as before. - Player can't use shield with stamina < 7. - Rare items cannot be bought from traders anymore! - Spanish is avilable in the main menu. (only in main menu for now). - Totem decay protection now is 24, 48 and 72 hours as maximum - therefore the maximum sacrifice amount is set to 2300. Forwardet it to the Devs. Sounds good.